Inform and analyze with absolute ease. The long term success of the enterprise is wholly dependent on effective transmission of mission-critical information throughout the organization. Demonstrating the impact of individual decisions for management and employees alike demands an intuitive reporting solution, one with exceptional performance and customizable options. 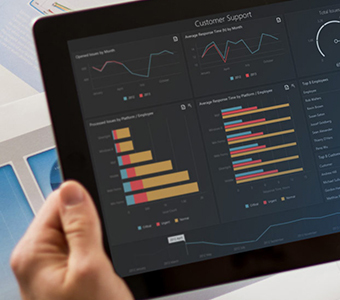 Adsystech's Dashboards and Analytics delivers easy-to-use customizable options and a rich set of report controls, including multi-dimensional pivot tables and charts so you can build reports of unmatched informational clarity. In addition to the integrated analytics, Adsystech's ECM solution can easily connect to other third party business intelligent solutions like PAWS (formally SPSS), iDashboard or Tableau.